In the 2017 Class 1A, Division I state tournament, Hanover girls faced Dighton in the first round. The Hornets were the defending Class 1A, Division II state champions and had point guard Sara Cramer and forward Jordan Speer. Both cleared 1,000 career points. Cramer has been a key player for Hutchinson Community College the last two seasons, and Speer throws for the University of Missouri track team. Hanover had never won a state tournament game. The year prior, the Wildcats lost 59-46 to Hoxie in the first round of state. Hanover, with its aggressive style, made school history with a 49-34 win versus the Hornets. Cramer, Speer and Dighton post Ella Roberts all fouled out. It marked the first time Cramer and Speer had both fouled out in a contest. Hanover had a 10-0 run to start the fourth quarter to put the game out of reach. Dighton had 23 turnovers, tied for its most all season. The player of the game was Hanover forward Macy Doebele, then a sophomore. She delivered a game-high 18 points, collected five rebounds and went 8 of 12 from the free throw line. The athletic Doebele caused Dighton to foul throughout the contest. The contest encapsulated Doebele’s hallmark career. Hanover has used its hard-charging style to force turnovers, put teams in foul trouble and often used big runs to earn victories. 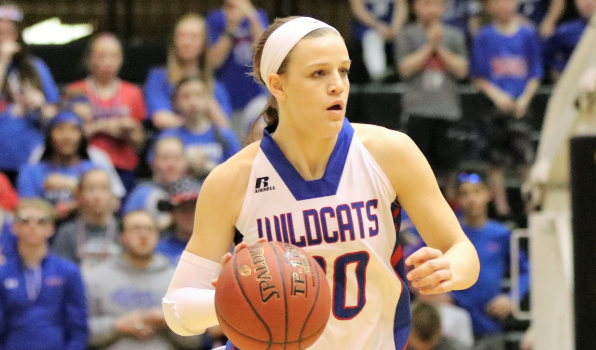 The Wildcats, despite rarely shooting a higher percentage than their opponents at state, have captured the last two Class 1A, Division I state titles. “We are a fun team to watch because we play at a fast pace and get pumped up during the game,” Doebele said. Hanover is a combined 45-5 in the last two years in the first two seasons under head coach Chris Beikmann, a former assistant and Hanover alum. After the Dighton game, Doebele delivered another milestone moment with a 58-57 semifinal victory versus rival Centralia. At that point, Centralia was 9-1 in final four victories dating back to 1975. Beikmann had called Centralia “like our older brother” to Hanover. Hanover jumped out to an 8-0 lead and held on late. In the championship, Olpe focused on Doebele on the game’s final play, which allowed Tianna Lohse to hit a buzzer-beating state-winning trey for a 50-47 win versus Olpe. Opponents collectively shot 44 percent at state, while Hanover made 35 percent of field goals. The Wildcats made 20 more three throws and had 27 fewer turnovers. Last season, Hanover had a massive late first round state comeback against league foe Frankfort in a 50-47 victory. The Wildcats shot 18 more free throws and had seven fewer fouls against a squad that had beaten them in the regular season. In the semifinals, Hanover beat South Central behind 20 points and 11 rebounds from Doebele as the Wildcats forced the T-Wolves into foul trouble early. “The long and short of it was, I thought they played tougher than we did,” SC coach Tim Riezke said at state. In the title, Doebele had 19 points and 12 rebounds as Hanover delivered their style of play against St. Paul. The Wildcats opened the third quarter on a 9-0 run and earned a 48-28 victory. The game had 55 possessions. In Hanover’s first two state contests, the Wildcats delivered 58.5 possessions a game, while St. Paul averaged 45.5. Overall, Hanover shot 27 more free throws than opponents at 2018 state. Doebele has earned back-to-back classification player of the year honors. The 5-11 Doebele, a 4.0 student, is one of the state’s most accomplished athletes and has signed to play basketball at Washburn. She earned offers from Washburn, Emporia, Nebraska-Kearney, Austin Peay and Western Illinois. Doebele has tallied 1,048 career points. She averaged 9.8 points, 5.9 rebounds and 1.7 steals a game as a freshman. As a sophomore, she scored 15.3 points, 6.1 rebounds and 2.2 steals. Last season, Doebele upped to 19.4 points, seven rebounds, 3.1 assists and 2.5 steals. Additionally, she has helped Hanover achieve new success in volleyball. Her sophomore year, Hanover went 38-8 and finished as Class 1A, Division I runner-up to Centralia. It marked the Wildcats’ first state berth since 1979. Her junior year, Doebele collected first team all-state volleyball as Hanover again reached the state tournament. This fall, she was first team all-league in volleyball. In track, Doebele reached state in a pair of relays as a freshman with her best finish fourth place in the 400-meter relay. Her sophomore year, Hanover was 1A state runner-up. Doebele ran on the 1,600-meter relay that won the state crown and the 400-meter relay that was second. She was fourth in the triple jump. Last spring, Hanover won state track as Doebele took first in the triple and third in the long jump. The 400 relay was second and the 1,600 relay took third. Hanover captured the first ever girls’ state title in school history. As well, Doebele took dance for more than 12 years. “Which usually surprises people because they don’t see me as a dancer,” Doebele said. Doebele has enjoyed her greatest success in basketball. She has also played with AAU Ohlde Elite basketball the last three seasons with Nicole (Ohlde) Johnson. She traveled in tournaments across the country, had basketball workouts and went on runs. Her role models are Johnson, a former Clay Center and Kansas State standout and current assistant coach at Bethel College, and Shalin (Spani) Klein. Klein, a former Kansas State player, is married to Collin Klein, former Kansas State All-American quarterback and current Wildcat assistant coach. “Both helped me develop my game and really motivated and pushed me to excel,” Doebele said. This season, Lohse and Doebele return for the Wildcats, part of the newly configured Class 1A that is one class and no longer Division I and Division II. Hanover is ranked second behind Central Plains and ahead of South Central, Frankfort and Centralia in a stacked class. CP, with Emily Ryan, enters this season on an 84-game winning streak. Lohse averaged 12.3 points a game for a squad that returns 71 percent of its scoring. “My goal this season is to improve upon my offensive skills and to be successful as a team and make it back to the state tournament,” Doebele said. This feature is presented by Citizens State Bank in Hanover, proud to support Macy Doebele and Hanover High School Athletics. Ohlde Elite would like to wish Macy best of luck this season. Proud of all of your accomplishments. Nicole Ohlde Basketball Academy is proud to support high school basketball in the state of Kansas. I started playing basketball in 1st grade. My parents got a team together for my sisters in 3rd and 4th grade and I played with them. They were the reason I got so involved in basketball. My goal this season is to improve upon my offensive skills and to be successful as a team and make it back to the state tournament. I think if we have everyone healthy, we have a chance to be a good team this year. What makes me such a force as a player is my heart, determination, and the fact that I am a versatile player that can be a threat on both offense and defense. Being from such a small town, sports brings everyone together. The community gets excited and supports our team’s success. We are a fun team to watch because we play at a fast pace and get pumped up during the game. I would say my strengths are my court vision, my defense, and my ability to take it to the basket and draw fouls or pull up a jump shot. A weakness is keeping my shot consistent. Tianna Lohse will be a key player this year, but everyone on the team is extremely important and has their own role on the team. My favorite thing about basketball is the intensity of the game. I love walking onto the court hearing the crowd cheering and the thrill of playing in close games. Yes, I also do volleyball and track. In volleyball I have played most positions, but this last year I was setter/outside hitter and in track I do long jump, triple jump and run in sprint relays. Coach Beikmann is a very positive and receptive coach. It is easy to talk to him about the game and he values my insight into what is happening on the court. Our team played in a summer league in Clay Center and went to weights to work on our strength and agility. I personally also played AAU basketball for the third consecutive year for Ohlde Elite, traveling across the country playing in tournaments, had basketball workouts with a trainer, and went on runs. I have had contact with numerous coaches and offers from several schools, however, next year I plan to play basketball at Washburn University. In 10 years I hope to have a stable job and starting a family. I wouldn’t say I have a favorite subject in school, but I am a very hardworking student and I have a 4.0. My role models are Nicole (Ohlde) Johnson and Shalin Klein. Both helped me develop my game and really motivated and pushed me to excel. Honestly at home, my mom is an amazing cook and her food is always delicious. I took dance for more than 12 years, which usually surprises people because they don’t see me as a dancer. Hanover girls are back-to-back state champions, winning state for the first time in school history in 2017. Before that year Hanover girls had never made it past the quarterfinals at state.